Food is a key component of culture and health and a great way to explore and connect with different societies. Here we discuss the primary foods found in the Ugandan diet and how your monthly contribution enhances the nutritional status of the students at Rock of Ages (ROA). Ugandan cuisine is primarily made from local and readily available ingredients. Foods are eaten seasonally with fresh produce from local gardens playing a key role in the majority of diets. Nearly 90% of Ugandans rely on outdoor charcoal or firewood burning stoves for food preparation. Because cooking oils, such as animal fats and vegetable oils, can be costly food is typically boiled or grilled. Pot cooking is most common and a majority of dishes are made up of a protein centered soup or stew served over a filling starch. Even at Rock of Ages School charcoal stoves are used to prepare student lunches. Popular meats throughout the country include chicken, goat, and beef. However meat is too expensive for most families so legumes are often served as a main source of protein. It’s estimated that nearly 90% of all calories consumed each day by the population of Uganda come from vegetarian sources, meaning meat does not play a large role in the Ugandan diet. Abdu Wasswa shows off some freshly picked beans that when harvested will be used for student lunches. Despite the fact that nearly half of the largest lake in all of Africa, Lake Victoria, lies within the borders of Uganda, fish is not readily available throughout the nation. Often found on a stick and grilled whole, fish is most commonly consumed in the south, along the shores of the lake. Lake Victoria is the worlds second largest fresh water lake and also the source of the Nile River. Posho is the most popular starch in Uganda as it is inexpensive and simple to cook. Similar to polenta, posho is made from cornflour and will take on the flavor of whatever dish it accompanies. Posho is also easily made at home as many families grow their own maize, grinding it at a local mill which can be found in nearly every village. Rice is served in the same fashion as posho but is typically reserved for special occasions as it requires more time and work to prepare. Parents and students volunteer to help harvest maize grown on the ROA property and will be used for school lunches. Cassava (also known as yucca) is another popular starch and when served with stew is generally cut into chunks and boiled. However, cassava can be prepared in many forms. Dried and pounded cassava can be used as flour. When cut, sliced, and fried, it becomes comparable to french fries. Cassava is a hardy root and a dependable crop for many who grow their own food. Other common tubers that are prepared in the same ways as cassava include irish potatoes and sweet potatoes. Like other carb-filled foods, these starches are digested slowly, lending a feeling of fullness to the individual consuming them. Betty Wasswa shows off a massive piece of cassava root, grown on the ROA property, and to be used for school lunches. Lastly, matoke is a type of banana, similar to a plantain. Matoke is often served mashed, after being picked green, peeled, and steamed in its own tree leaves. Instead of being used to accompany a stew, matoke is more of a main dish and is served with a vegetable sauce or a sauce made out of groundnuts (peanuts) which are usually referred to as “g-nuts”. Banana’s harvested from the ROA property which hosts a variety of fruit trees. All fruit is used to supplement school snacks and lunches. With the equator running through the center of the country, Uganda has a tropical climate which makes it the perfect environment for growing fruits. Over 84 varieties of banana, all of which are local to eastern Africa, grow in Uganda. As one can imagine, banana’s play a large dietary role due to their availability. From matoke (described above) to small sweet bananas that are considered a dessert, these fruits are a staple throughout the country. An indoor market in Jinja, Uganda. Other tropical fruits such as mangos and pineapples also thrive throughout most regions. Jackfruit is a large fruit that can grow to up to 80 lbs with a mature jackfruit tree producing up to 100-200 fruits in a single year! The many individual fruit pods within the jackfruit are edible and when ripe are sweet and chewy. The seeds are also edible and when roasted have a similar taste to chestnuts. ROA students play in a jackfruit tree on the ROA property, showing a small jackfruit. Jackfruit being cut and sold as a quick snack at the market. Vegetables are not highly consumed throughout Uganda. Many do not understand the importance of vegetables, especially greens, in their diets. Variants of greens that are indigenous to the area such as amaranth and nightshade can be picked wild but are often viewed as a weed due to their bitter taste and are therefore given as feed to farm animals. Culturally, many vegetables are viewed as a “poor man’s food” and many choose not to eat them due to stigma, opting for more popular and filling starchy options such as those described above. When greens are prepared they usually come steamed or collard- fresh salad is not a common dish. Other common foods include chapati and samosas. Originating in India, these foods have become common in Uganda due to a large population of Indian immigrants to the country. Chapati is an unleavened bread traditionally cooked with wheat flour then pan grilled. Samosas are fried pastries with a flakey outer shell that are usually filled with spiced potatoes, lentils, and/or meat. These are more of a snack item and most popular in urban areas. A variety of bugs are also often eaten as snacks and depending on the region different bugs are more popular. Nsenene is green brown type of grasshopper that is found in many African countries. After it is caught the wings and legs of each grasshopper are removed and the rest of the bug is eaten after being fried. A bag of Nsenene, fried, and ready to be eaten! Many factors contribute to undernutrition in Uganda including poverty, poor access to food, a diet lacking in diversity, as well as cultural and social traditions. In Uganda, just under 40% of all children are chronically undernourished or stunted. Nearly ⅓ of all child deaths are related to undernutrition and those who continue to survive are at a high risk for infectious diseases, chronic diseases, as well as impaired cognitive development. Micronutrients play a major role in overall health and when proper levels are not met a variety of health complications may occur. Due to a low intake of animal based foods as well as fruits and vegetables high in beta-carotene, vitamin A deficiency (VAD) affects 28% of children in Uganda. VAD can lead to blindness as well as an impaired immune system. Iron deficiency is even more common in children, with 73% estimated to be iron deficient or anemic which may lead to heart problems, an increased risk of infections, and motor/cognitive developmental delays. Such a high number of children suffering from iron deficiency is most likely caused by both diet and environmental factors. Most iron in the Ugandan diet is consumed through fruits and vegetables which is more difficult for the body to absorb than iron found in meat products. Parasitic infections such as malaria and hookworm, as well as chronic diseases such as HIV/AIDS are very common throughout the country, contributing to the high number of children living with anemia. These two deficiencies and their accompanying complications are only a few in the vast array of nutrition related inadequacies that plague the children of Uganda. Understanding that most ROA students face food insecurities at home, the provision of food for all students is a priority of the Hands4Uganda program. 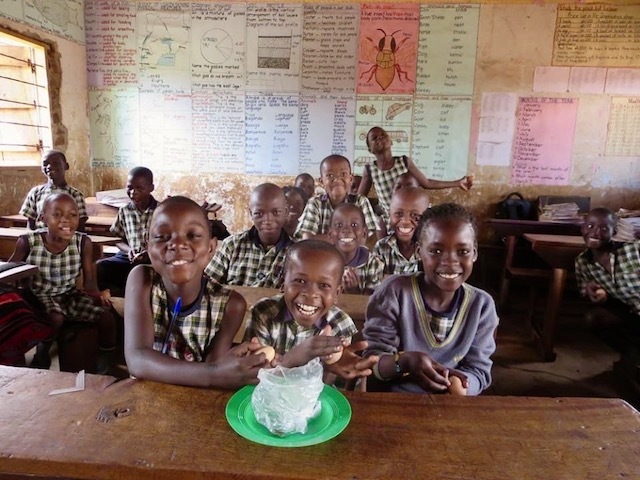 Through sponsorship dollars all students are served porridge each morning. Students starting the school day with full tummies ensures that they will have the energy to fully participate in class and will be able to focus on their work. Students in the nursery section enjoying their morning porridge. A typical lunch at ROA is comprised of beans (prepared with onions, tomatoes, carrots, and garlic) and posho with accompanying greens or fruits whenever they are available. We are doing our best to increase the nutrient intake of our students. The new school property is currently being used as a garden and is producing fruits and vegetables for student consumption. A student in the primary section enjoys a hot bowl of beans and posho for lunch. Once the new school is constructed there will be gardens throughout the property where fruits and vegetables will be grown for student consumption. We hope to develop an agricultural aspect to the ROA program so that students will learn to grow and tend to both fruit and vegetables that could improve their health as well as their familie’s health. Abdu Wasswa shows off a freshly picked cucumber from the ROA property that will be added to school lunches. Through sponsorship every child at ROA is provided with food each day. We understand though that to have a greater impact on their overall nutrition, access to more than one full meal a day is necessary. To further the reach of sponsorship dollars we created a “Premium Sponsorship” option which provides a food package for your sponsored child’s family at the beginning of each month. Instead of giving the extra funds directly to parents, administrators at ROA purchase food in bulk and distribute directly to student guardians. For families with as many as seven children, these monthly food packets ensure that students and their families have sufficient access to food at home. A primary student with his mother and baby sister receiving their monthly food packet thanks to a generous sponsor. If you are interested in learning more about how you can provide monthly food to your sponsored child and their family please click here. If you would like to experience a ROA lunch of rice and beans check out this recipe for a very similar dish!